How to Make a Chair Pad | Do-It-Yourself Advice Blog. Chair pads are a great way to bring a little extra color and comfort to your dining room or breakfast nook. 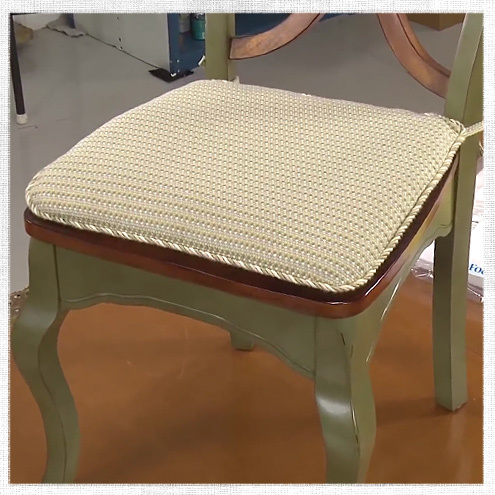 A simple chair pad can easily be DIY-ed and is a great project for beginner sewers! A chair pad can be an easy way to try out bold colors or patterns in a room, not to mention a cushion will up the comfort level of any dining room chair. Our chair pads feature a simple design and attach to the chair with ties at the back of the cushion. To add a little extra style, we used a decorative Sunbrella piping around the perimeter of the chair, but you could leave this off or create your own piping for an exact match with your fabric. If you wanted to add more interest to your chair pad you could add button tufting using Snap Together Button Forms, V-92 thread and a long needle. We filled our chair pad with a 2 inch thick piece of Fairfield’s Poly-Fil Nu-Foam, which is a densified polyester batting. Nu-Foam is a great choice for chair pads because it can be hand washed, so you can wash the whole cushion in case of spills. However, if you prefer the feel of denser foam, 2” polyurethane foam is also a great choice. 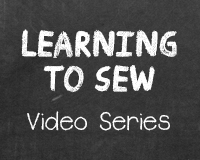 This video will walk you step-by-step through the process of making a chair pad including how to pattern your fabric, cut the foam, sew piping, make fabric ties and insert the foam. If you’d prefer the look of a whole seat cover to the chair pads, check out our tutorial How to Make a Kitchen Chair Seat Cover. All the materials needed to make these chair pads are available at www.sailrite.com. Have you done a project like this before? Share your ideas and tips in the comments! Pingback: How to Join Piping Ends | Do-It-Yourself Advice Blog. Pingback: What Is Geobella Fabric? | Do-It-Yourself Advice Blog.